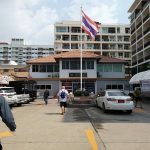 In my effort to try out some new hotels and share those experiences with the readers of Pattaya Sanook, I selected the Adelphi Hotel on Soi 21 as the next new hotel to try out. 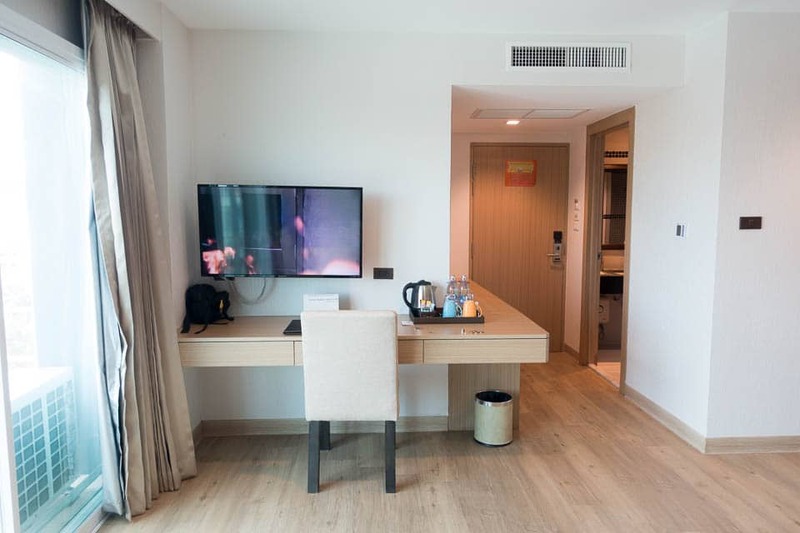 After staying at the more budget friendly D Hotel, I decided to go a little higher end, and the Adelphi Pattaya fit the bill nicely. Adelphi took over the hotel from another company a few years ago and gave it a complete renovation. 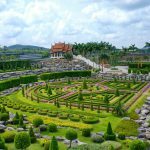 Everything is nice and new and the hotel is in a great location off of Soi Buakhao. 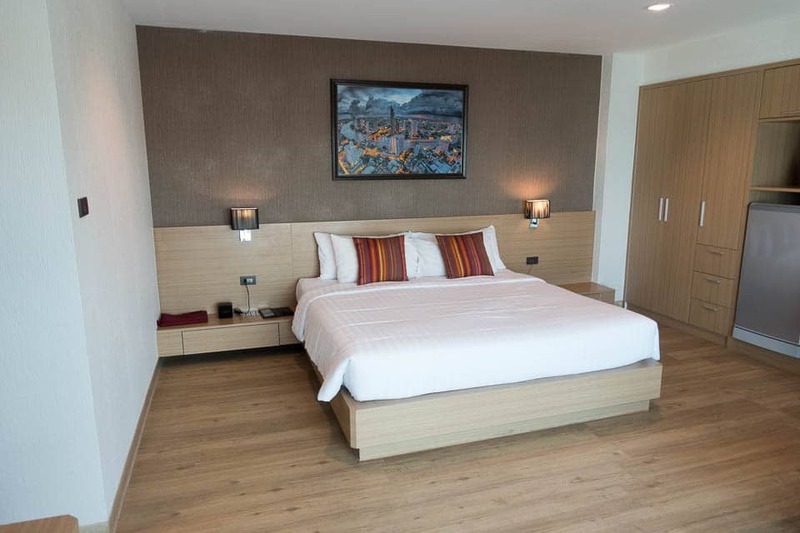 I booked one of their Adelphi Premier rooms on Agoda (got to get those Agoda points) which is their best type of room. The room was on the front side of the building overlooking the street and the P.P. Massage Parlor across the Soi. I thought it might be noisy with the buses of Indian tourists coming and going all day, but being on the 7th floor, things were very quiet. I was very happy with my stay there and found everything to my liking. They have a nice pool and gym, and strong wi-fi. The staff were very helpful and friendly. 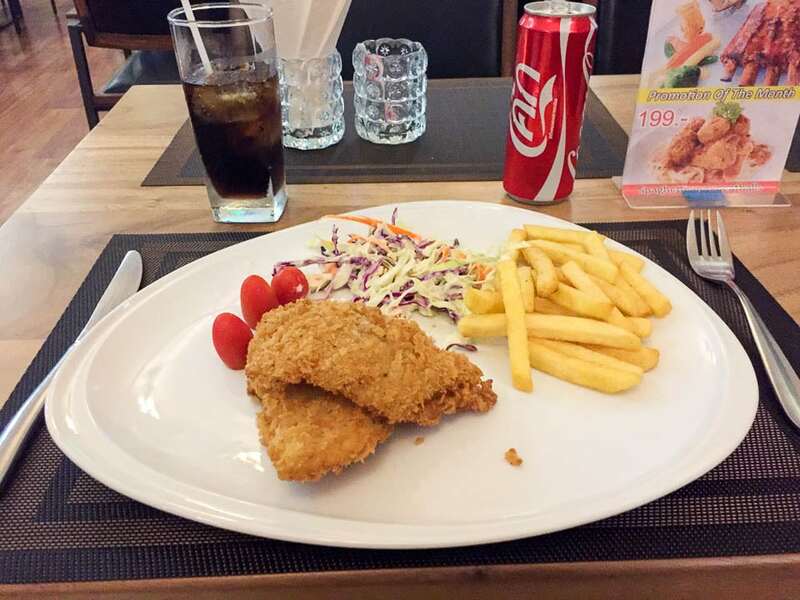 Although I did eat at the restaurant on several occasions, it was out of necessity and not because I found the food all that great. I’ll cover everything in my full review below. 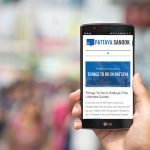 But if you don’t want to bother, here is the short version: It was a great hotel and I give it the Pattaya Sanook seal of approval. The entrance to the hotel requires you climb a flight of 10 or so stairs. There is also a ramp which is quite steep, but makes the hotel wheel chair accessible. Being up off the Soi is probably a good thing on a street that is prone to flooding, but it can be a bit of pain after you’ve had a few too many. The lobby seems large as it is one big open area with the hotel restaurant and bar. 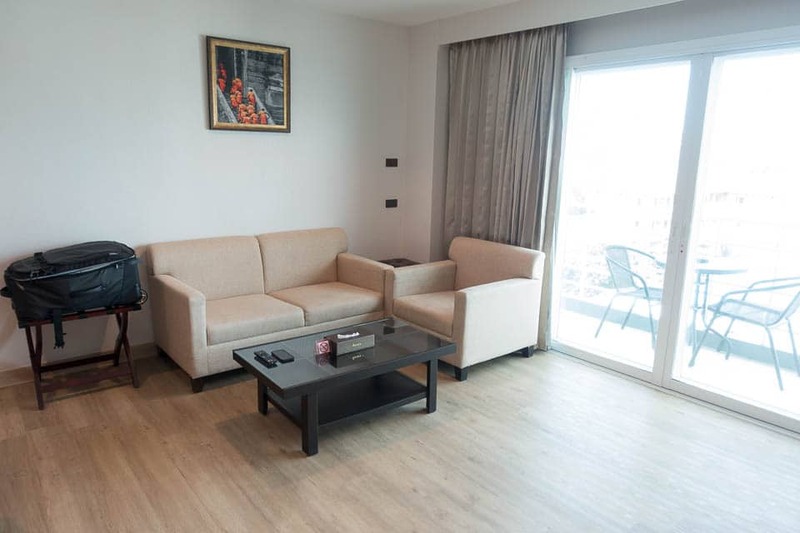 There are several couches for guests to wait for you or for you to sit as you wait for your taxi pickup. It is simply decorated but is new and looks quite nice. There are two computers for guests to use which are free. In the back, past the restaurant and elevators is the dining hall where the buffet breakfast is served. Further on is the gym. As I mentioned in the overview, I booked the Adelphi Premier room which is their largest and nicest type of hotel room. The room is 40 sqm and comes with a built-in desk and a nice little seating area with a couch, love seat, and coffee table. The seating area is a nice treat and it provides a good place to relax and watch TV or eat your takeout meal. There is a good-sized closet with robes and slippers and it has a lot of room to hang your clothes or places them on shelves. Inside the closet is where you will find the in room safe. 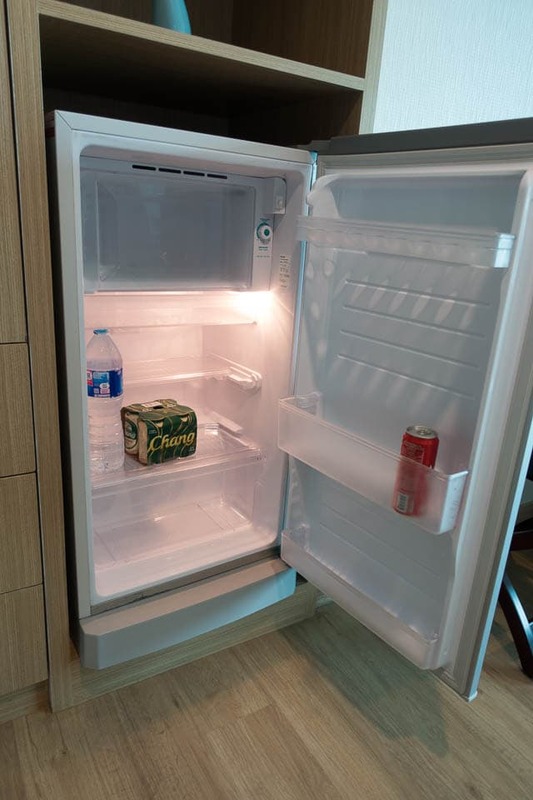 The fridge is big and does not come pre-stocked with a mini-bar. This is something I like as I rather stock up on food and drink that I like and not pay exorbitant mini-bar fees. You get the refrigerator all to yourself. Mine looks a little sparse in the picture, must have been before the grocery run to the Big C Extra. The TV is mounted on the wall with a swivel bracket so you can watch it from the couch or bed. The size is large enough that you can get a good view from either location. You get the standard two bottles of water per day. Though on some days I found the cleaning staff had left me two fresh bottles even though I still hadn’t opened the ones from the day before. I thought that was a nice touch. There is a hot water kettle and a selection of instant coffee and tea. You get a couple of nice mugs, spoons, and glasses to use as well. There is even a bottle opener and cork screw provided, which is a nice detail that more hotels should think about including. 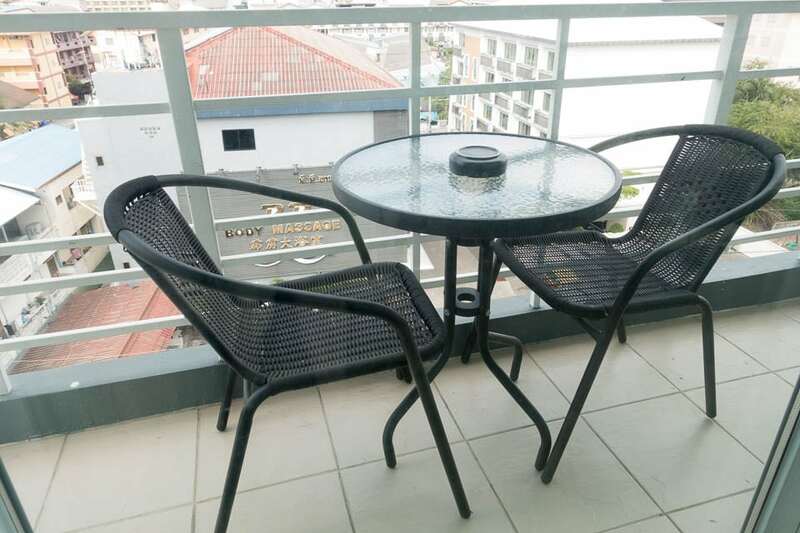 The balcony is a nice area complete with a small table and two chairs. It was where I’d like to enjoy and evening beer and catch up with things back home while I enjoyed the fantastic weather we were having. If I got up early enough, I’d enjoy a morning coffee out there as well. 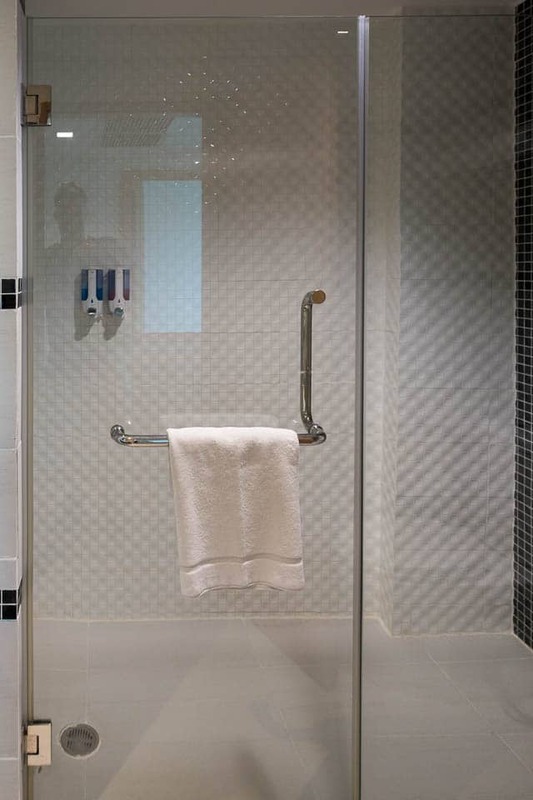 The bathroom isn’t the largest, but it has a big walk-in shower which I really like. 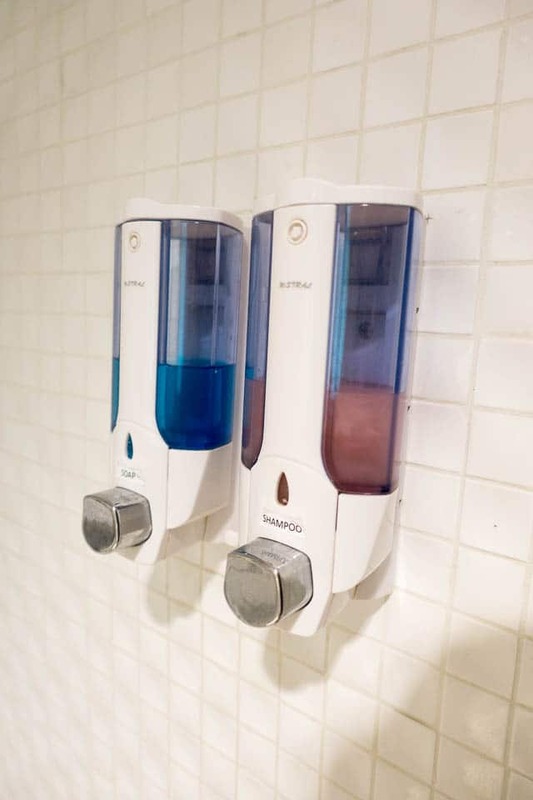 They also have the built-in dispensers for soap and shampoo. 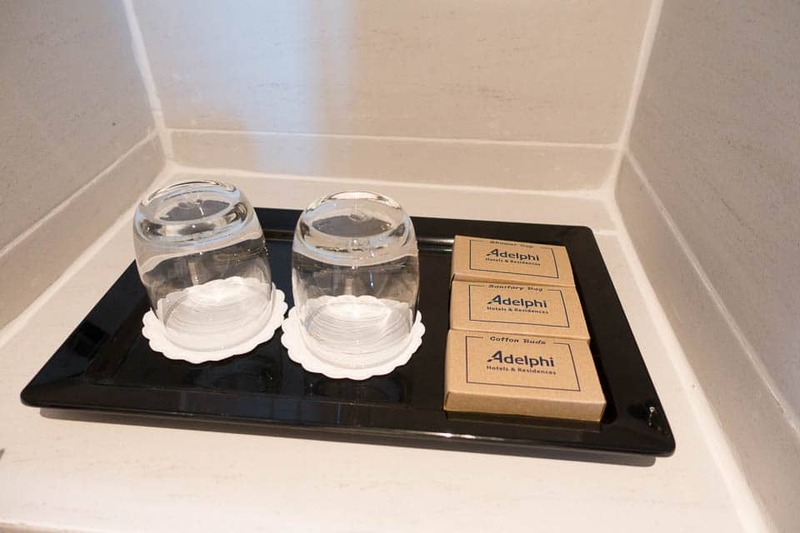 Next to the sink the Adelphi Pattaya provides a couple more glasses, a shower cap, cotton swabs, and a hand soap dispenser. 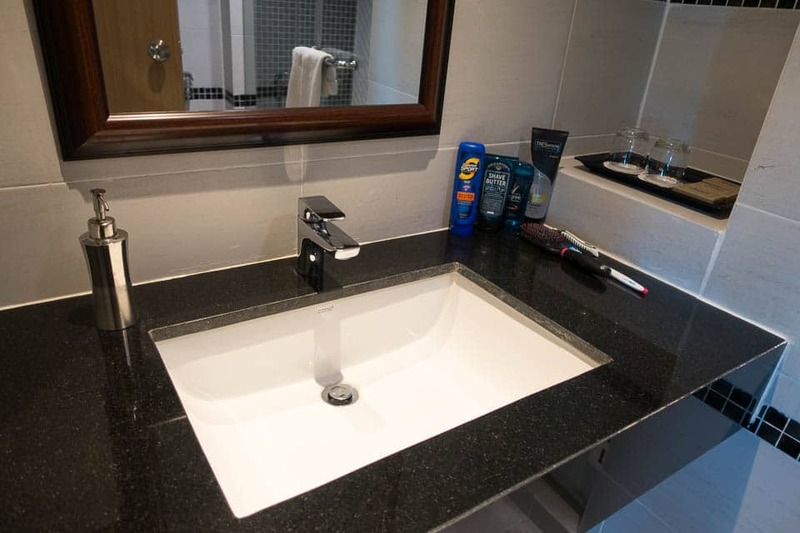 There are no extra toothbrushes for guests, but I would imagine the front desk might have them if you requested one. 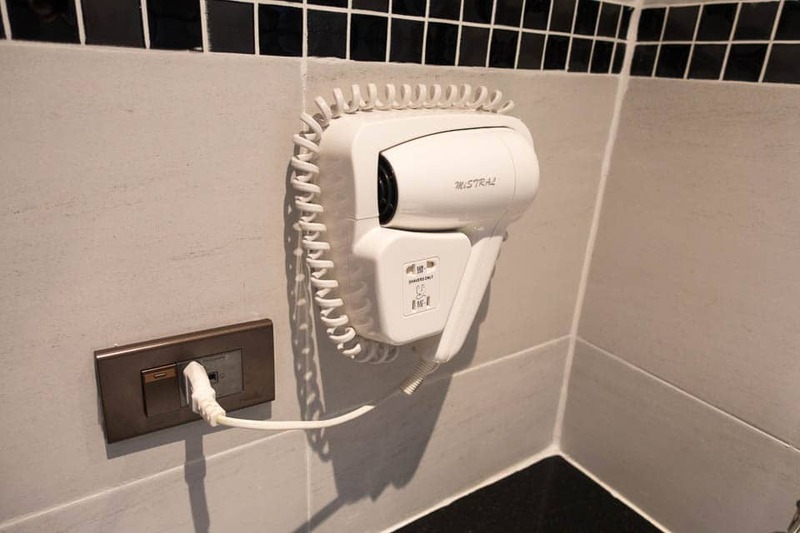 There is also a built-in hair dryer for those who need it. I do not fall into that category. 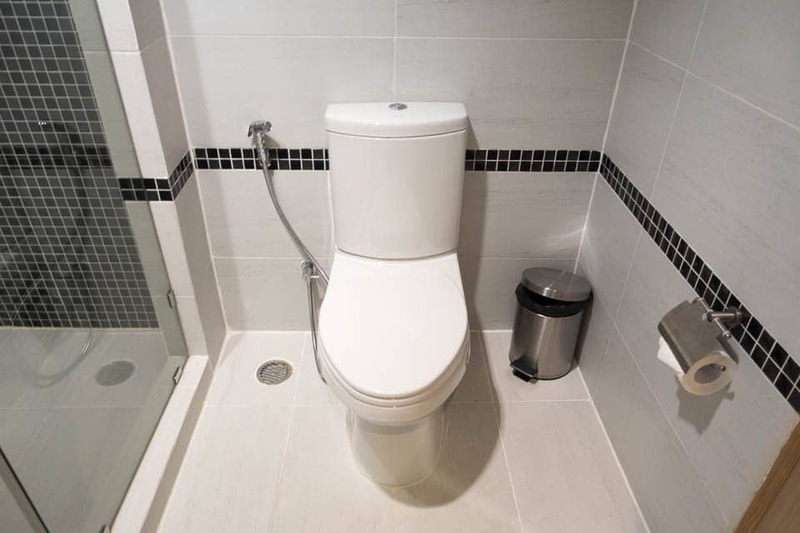 The commode comes complete with bum gum for those who like a fresh spritz on their derriere. I found the Wi-Fi signal to be strong and no issues with my connection. I was able to surf the web, check email, and stream a couple of Netflix movies without any problems. You can connect multiple devices at one time, each has to log in to the network with the password. There was no Ethernet outlet that I could find, so all devices have to connect over the wifi. Unless you bring your own travel router. The roof top swimming pool at the Adelphi Pattaya is quite nice. There are sun loungers around the pool with umbrellas for shade if you need a break from the sweltering Thailand sun. There is a place to shower off before entering or exiting the pool. 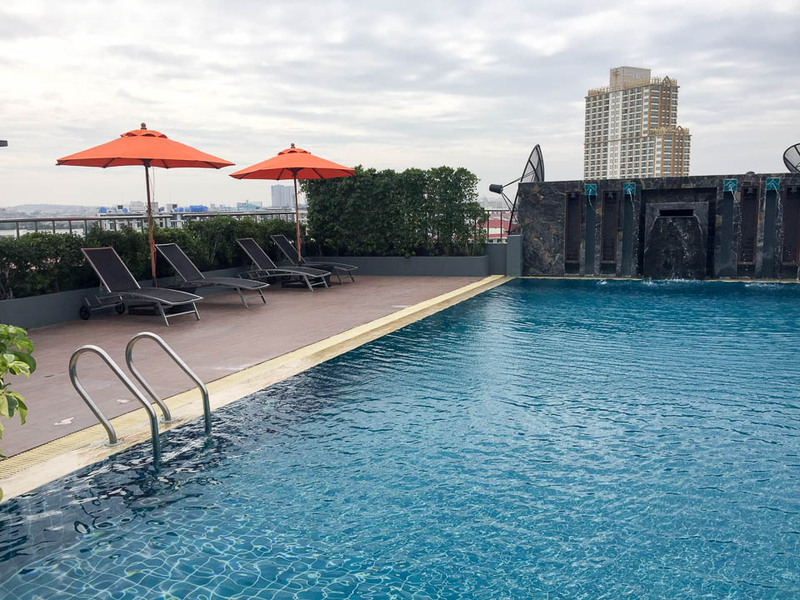 The Dip and Sip is the name of the roof top pool bar. They serve up a selection of cold drinks, both the alcoholic and non-alcoholic varieties. The smoothies are very good, and I’d recommend you try one. You can also order food and have it brought up from the kitchen. 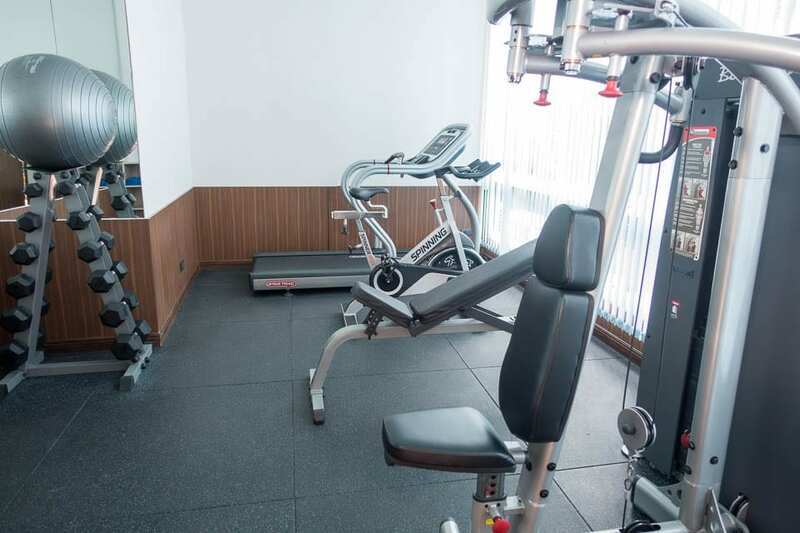 The fitness center is a small but has nice equipment and you can get a good holiday workout in. There is a treadmill, exercise bike, an adjustable bench with dumbbells, and a pec deck machine. 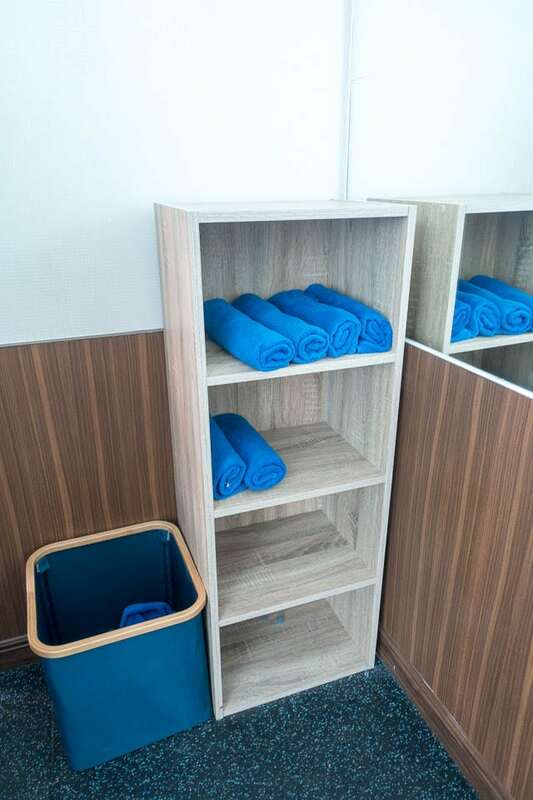 One nice touch is they have free towels that you can use during your workout. The gym is located in a strange spot out the back of the building. You have to head through the dining hall and out the back. If you can’t find it on your own just ask the hotel staff to show you. The restaurant is where the Adelphi Pattaya falls a little short. I wasn’t feeling well a couple of nights and decided to just eat at the hotel and stay in for the evening. I was the only customer every night, and never saw anyone else eating there. The first meal I had wasn’t bad. 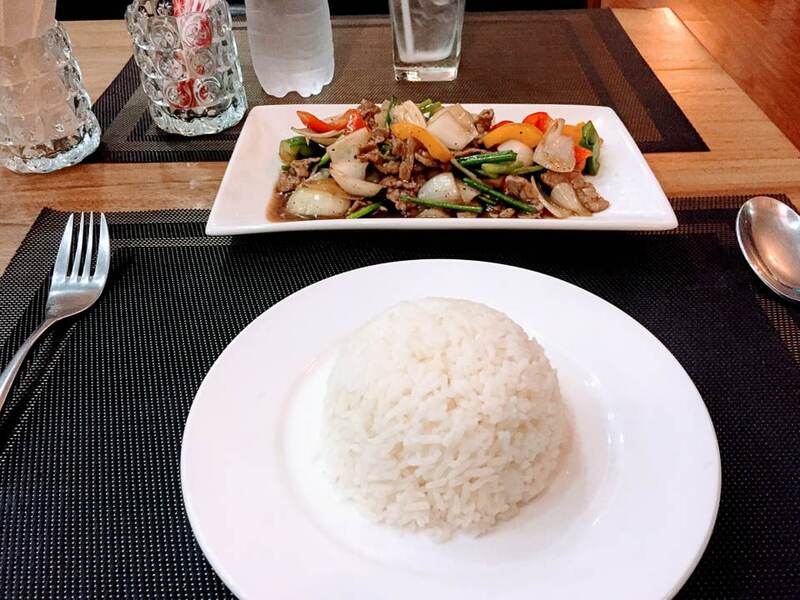 It was beef in black pepper sauce with a side of rice. The price was a little expensive for what I received in my option. The next night I went with Fish & Chips. What a disappointment. Two small fillets that tasted like they just came out of the freezer and where heated up. The chips were just a small portion of french fries. Plus it wasn’t cheap. I had to make up for it later by getting some good fish & chips at the Jolly Friar. If you get breakfast included with your room costs the Adelphi Pattaya puts on a nice spread in the morning. It is a buffet with a selection of fruits, breads, pancakes, bacon, sausage, and some other things too. They even have an omelet bar where you can get your eggs made to order. There are some Asian food options as well. While I was staying at the hotel there were quite a few package tours staying there as well. Some mornings the breakfast area was super crowed and it was hard to find a place to sit. When these tour groups left, things were back to normal. I found the hotel staff to be both friendly and helpful. I was always greeted warmly by the doormen. They will open the door for you as you come and go as well as help you with luggage or getting up the steps with bags if you need it. The cleaning staff were good and my place was quite clean. Although sometimes I wondered how thoroughly they were sweeping up the place as I’d find a few crumbs I’d left on the floor by the couch after snacking the night before. It was quite minor and gone after the next cleaning. I’ve covered the major amenities already. But just to recap: Roof Top pool with bar, gym, restaurant, free computers in the lobby, and in-room safes. The hotel provides laundry service, but I did not use it as hotel laundry service is expensive. I went a few doors down to one of the local laundry shops you find all over Pattaya. It’s much cheaper and they do a good job. There is underground secure parking for car and motorbikes. Your overnight guests can park their scooters there as well. 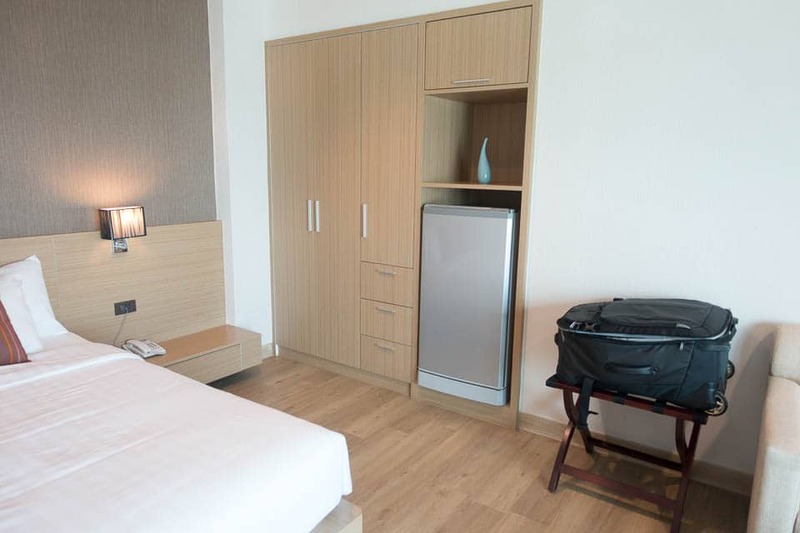 The Adelphi Pattaya is guest friendly with no joiner fee. 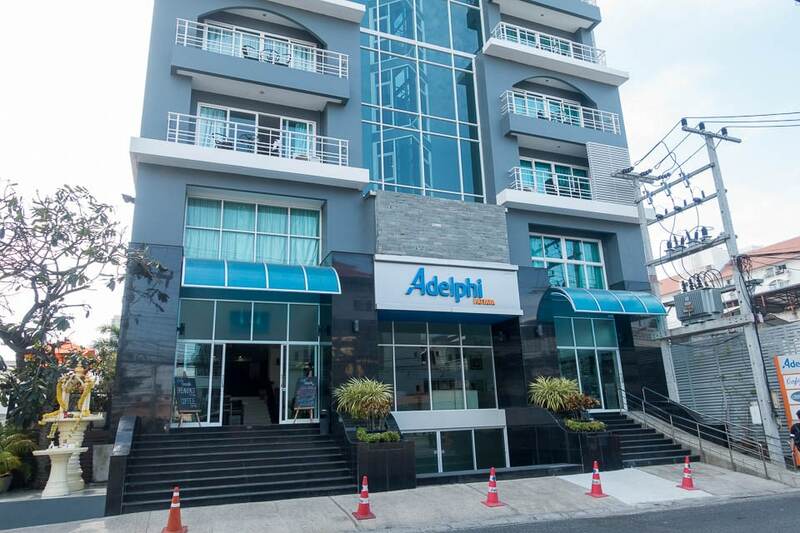 The Adelphi Pattaya is located in a good location on Soi 21, also known as Soi P.P. thanks to the Massage Shop of the same name. It is a quiet street that doesn’t get much through traffic. Soi Buakhao and Third Road are quick walks in either direction. 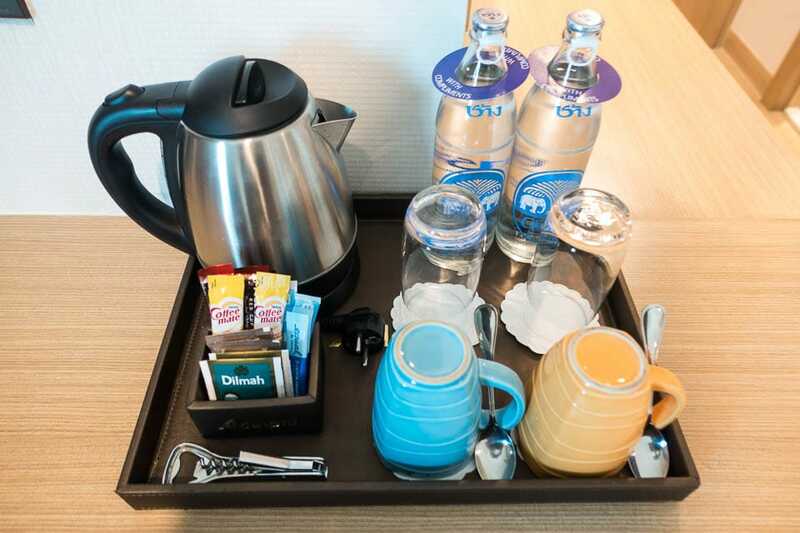 There are plenty of restaurants, laundry shops, 7-11, and other necessities nearby. There is a motorbike taxi stand a few meters down from the hotel or you can grab a Baht Bus on Soi Buakhao and be anywhere in minutes. I like to walk and the hotel is in a good location to get to where you need to go on foot. The Adelphi Pattaya is a very nice hotel in a good location. I enjoyed my stay and will surely add it to the short list of places to stay in Pattaya. It gets the Pattaya Sanook seal of approval and it sounds good to you, I’d recommend it. Its great to read another positive review of the Adelphi,im staying there for three weeks in july so reading this has justified my decision. Regarding the wifi,do they regularly change the password or is it likely to stay the same for the duration of my stay,not that im an heavy user anyway,i`ll only be using it for whatsapp on my iphone! I liked the hotel and I hope you enjoy your stay too. As far as the wifi goes, I don’t recall them changing the password during my stay, which was 10 or 12 days. Have a great trip! Thanks for that,,,,just one other wifi question which i should have asked prior,….do you have to enter the wifi password every time you leave and then re-enter the hotel premises? Honestly, I can’t remember the details, but it seems likely. I think that is the way most hotel internet works – either that or there is usually some sort of time out after several hours of use where you have to log back in again. Can’t remember exactly how it was setup at Adelphi.